Every year thousands of people undergo esophagectomies, a surgery to fix a damaged esophagus due to chronic regurgitation of stomach acid (Barrett’s Esophagus), esophageal cancer, as well as children born with defects of the esophagus. The excised tissue is often reconstructed from the stomach or large intestine, i.e. through a gastric pull up, forcing patients to be fed through tubes in order to stay alive. This significantly lower quality of life, and the risk of complications after surgery is extremely high and with a 5 year survival rates of under 20%. The California-based startup D&P Bioinnovations has developed an implantable, bioresorbable medical device that can regenerate the damaged esophagus within the body. The device is a small cylinder tube, encapsulated with stem cells that aid in the regeneration process, and can be delivered by a thoracic surgeon through minimally invasive endoscopic techniques. The product itself is developed by utilizing a proprietary source of wound regenerative induced allogeneic stem cells, which is implemented onto a unique electrospun biomaterial. The cellular material is grown in a bioreactor, followed by a washing process leaving only the secreted therapeutic factors from the stem cells that are key to the esophageal tissue regeneration. A prototype of the bioresorbable device has successfully undergone preclinical animal studies with promising results. Operations that resect the esophagus are challenging procedures with high rates of morbidity and mortality. These procedures not only lowers quality of life, but essentially forces patients into a life-ending surgical operation. For many patient groups, this is their only option. 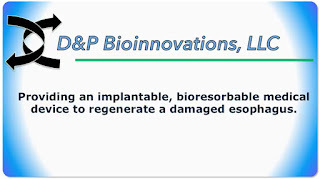 D&P Bioinnovations has developed a technology and potentially a new treatment option that allow patients to avoid reconstruction and resulting feeding tubes, significantly increasing quality of life. It could increase survival rates, decrease surgery time and potentially save over $200,000 per treatment compared to the standard esophagectomy. In addition, the startup believes their innovative product can serve as a platform technology, regenerating damaged blood vessels, muscle, tendons and ligaments, gastrointestinal ulcers, and nerves, highlighting the huge potential of the technology. D&P Bioinnovations was founded in 2015 and has since won multiple awards, including TiE International Start Up Competition 2016 and VentureWell ASPIRE Healthcare Award 2017. In addition, the startup has taken part in MassChallenge, OneStart, Yei Start in France, John Hopkins Technology Ventures, Rice Business Plan Competition, and has received grants and funding from NIH and NSF.